The claim: Rising atmospheric CO2 concentrations are lowering seawater pH, resulting in reduced calcification, metabolism, fertility, growth and survival of many marine species. Another dire prediction that has raised its ugly head in the climate-alarmist-inspired campaign to force reductions in anthropogenic CO2 emissions is the contention that continued increases in the air's CO2 content will lead to ever more carbon dioxide dissolving in the surface waters of the world's oceans and lowering their pH values, which phenomenon is claimed to make it more difficult for biological calcification to occur in marine organisms. 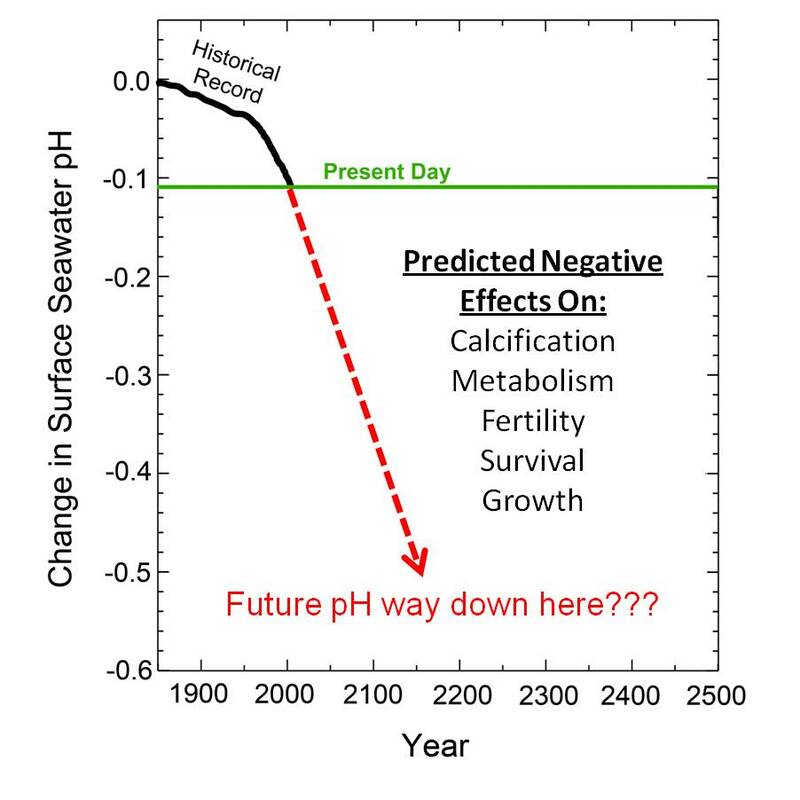 It has been estimated, for example, that the globe's seawater has been acidified (actually made less basic) by about 0.1 pH unit relative to what it was in pre-industrial times; and model calculations imply there could be an additional drop somewhere in the neighborhood of between 0.3 to 0.7 pH unit by the year 2300. And a pH reduction of this magnitude is viewed by many as a cause for great concern, as it has been postulated to harm calcifying marine life such as corals, not only by reducing their calcification rates, but by negatively impacting their metabolism, fertility, growth and survival. This ocean acidification hypothesis has gained great momentum in recent years, because it offers an independent reason for regulating fossil fuel emissions in addition to that provided by concerns about global warming; for even if the models employed by climate alarmists are proven to be wrong with respect to their predictions of unprecedented temperature increases -- as well as all the catastrophic consequences associated with that warming -- those who desire to regulate CO2 emissions now have a fall-back position, which contends that no matter what happens to the planet's climate, the nations of the earth must still reduce their CO2 emissions because of their direct negative impacts on calcifying marine organisms. Over time, the rhetoric of these acidification alarmists has risen tremendously, as illustrated in a couple of quotes from a short, 21-minute film released in late 2009 by the National Resources Defense Council (NRDC) entitled Acid Test: The Global Challenge of Ocean Acidification (Natural Resources Defense Council, 2009). With Sigourney Weaver as its narrator, the film highlights the alarmist views of a handful of scientists, a commercial fisherman and two NRDC employees, as they discuss what they claim is a megadisaster-in-the-making for earth's marine life. The villain of the story is industrial man, who has "altered the course of nature" by releasing large quantities of carbon dioxide into the air via the burning of coal, gas and oil. According to Ken Calderia, a professor at Stanford University who appears in the film, "by mid-century, if we continue emitting carbon dioxide the way we have been, entire vast areas of both the Southern Ocean and the Arctic Ocean will be so corrosive that it will cause sea shells to dissolve," leading him to conclude that "we're really in the last decades of coral reefs on this planet for at least the next, let's say million plus years, unless we do something very soon to reduce CO2 emissions ... We're moving from a world of rich biological diversity into essentially a world of weeds." "We know that coral reefs are particularly sensitive to ocean acidification. And the reason for that is that corals are unable to form their skeletons as quickly as they used to, and reefs are starting to crumble and disappear. We may lose those ecosystems within 20 or 30 years. ... We've got the last decade in which we can do something about this problem. But it is very, very clear that if we don't start to deal with it right now, with very, very stern cuts to emissions, we are going to condemn oceans to an extremely uncertain future." The chemistry aspect of the ocean acidification hypothesis is rather straightforward, but it is not as solid as many make it out to be; and a number of respected researchers have published papers demonstrating that the drop in oceanic pH will not be nearly as great as the IPCC and others predict it will be, nor that it will be as harmful as they claim it will be. Consider, for example, the figure below, which shows historical and projected fossil fuel CO2 emissions and atmospheric CO2 concentrations out to the year 2500, as calculated by NOAA's Pieter Tans (2009). As can be seen there, his analysis indicates that the air's CO2 concentration will peak well before 2100, and at only 500 ppm compared to the 800 ppm value predicted in one of the IPCC's scenarios. And it is also worth noting that by the time the year 2500 rolls around, the atmosphere's CO2 concentration actually drops back down to about what it is today. When these emissions estimates are transformed into reductions of oceanic pH, it can readily be seen in the following figure that Tans' projected pH change at 2100 is far less than that of the IPCC. And Tans' analysis indicates a pH recovery to values near those of today by the year 2500, clearly suggesting that things are not the way the world's climate alarmists make them out to be, especially when it comes to anthropogenic CO2 emissions and their effects on the air's CO2 content and oceanic pH values. Another reason to not jump on the ocean acidification bandwagon is the fact that, with more CO2 in the air, additional weathering of terrestrial carbonates likely will occur, which would increase delivery of Ca2+ to the oceans and partially compensate for the CO2-induced decrease in calcium carbonate saturation state. And as with all phenomena involving living organisms, the introduction of life into the acidification picture greatly complicates things, as several interrelated biological phenomena must also be considered; and when they are, it becomes much more difficult to draw such sweeping negative conclusions. In fact, as demonstrated in numerous reviews of the scientific literature, these considerations even suggest that the rising CO2 content of earth's atmosphere may well be a beneficial phenomenon with many positive consequences (Idso, 2009; Idso and Singer, 2009). As an example of this fact, the Center for the Study of Carbon Dioxide and Global Change (hereafter, the Center) maintains an online ocean acidification database that may be accessed free of charge at http://www.co2science.org/data/acidification/acidification.php, showcasing over 1100 experimental results on this topic from the peer-reviewed scientific literature (as of Jan 2011). Specifically, their Ocean Acidification Database is an ever-growing archive of the responses of various growth and developmental parameters of marine organisms immersed in seawater at or near today's oceanic pH level, as well as at levels lower than that of today. The measured parameters included in the database pertain to changes in calcification, metabolism, growth, fertility and survival; and the data are arranged by marine organism, accessible by selecting an organism's common or scientific name. In addition, the data have been grouped into similar types of organisms, such as bivalves, corals, fish, nematodes phytoplankton, etc. In considering the experimental results that are archived there, the mean response suggests that ocean acidification may indeed harm some organisms. However, it is critical to note that the vast majority of these experiments were performed under highly unrealistic oceanic pH conditions that will never occur, rendering their findings meaningless in terms of what might possibly happen in the real world. And as one examines the results over the more-likely-to-occur pH decline range, a vastly different picture begins to appear. Returning to the Center's ocean acidification database, consider the figure below, which depicts the percentage changes in all five of the major life characteristics examined in the database (calcification, metabolism, growth, fertility and survival) as functions of the experimentally-orchestrated declines in seawater pH from the present, where each entry in the database is represented by its own individual point. As is clearly evident, the data portray an extremely wide range of pH reduction values, the greatest of which corresponds to an increase in the air's CO2 concentration in excess of 100,000 ppm, which is orders of magnitude greater than what anyone is expecting will ever occur. Thus, highlighted in grey are all data points that pertain to experiments conducted under pH conditions that are considered to be "far, far beyond the realm of reality." The low-end boundary of the unrealistic highlighted region of pH reduction shown in the figure is 0.5, which represents the high-end or maximum value of most IPCC-based projections of CO2-induced pH reduction, which occurs in the vicinity of AD 2300. Thus, there should be little argument - even from people who think ocean acidification is going to be a problem - in excluding all values beyond a pH decline of 0.5 when considering how acidification of the ocean might realistically affect earth's marine life. In the next graph to the right, results of all experiments that employed a seawater pH decline that fell somewhere in the still-more-likely-to-occur range of 0.0 to 0.3 are plotted, where the latter value is the approximate IPCC-derived pH decline in the vicinity of AD 2100. Then, within this range, highlighted in grey, is the much smaller seawater pH reduction range that comes from the work of Tans (2009), who derived a maximum pH decline that could fall anywhere within an uncertainty range of 0.09 to 0.17 by about AD 2100, after which seawater pH begins its long-term recovery. The Tans prediction range has been emphasized in this manner because his analysis is considered to be more realistic than the analysis of the IPCC. Thus, data within the pH reduction range of 0.0 to 0.17 should be considered as being most characteristic of what might possibly occur in the real world, as time marches on and fossil fuel burning continues as per business as usual. And, interestingly enough - and even incorporating pH reduction data all the way out to 0.30 - the linear trend of all the data is actually positive, indicating an overall beneficial response of the totality of the five major life characteristics of marine sea life to ocean acidification, which result is vastly different from the tremendously negative results routinely predicted by the world's climate alarmists. The next figure illustrates the averages of all responses to seawater acidification for all five of the life characteristics of the various marine organisms (calcification, metabolism, growth, fertility and survival) analyzed over the pH reduction ranges of 0 to 0.09 (from no change to the lower pH edge of the Tans estimate), 0.09 to 0.17 (Tans estimate), and 0.17 to 0.3 (from Tans to the IPCC). The most striking feature of this figure is the great preponderance of data located in positive territory, which suggests that, on the whole, marine organisms likely will not be harmed to any significant degree by the expected decline in oceanic pH. If anything, the results tend to suggest that the world's marine life may actually slightly benefit from the pH decline. Clearly, the results depicted above suggest something very different from the theoretical model-based predictions of the climate alarmists who claim we are in "the last decades of coral reefs on this planet for at least the next ... million plus years, unless we do something very soon to reduce CO2 emissions," or who declare that "reefs are starting to crumble and disappear," that "we may lose those ecosystems within 20 or 30 years," and that "we've got the last decade in which we can do something about this problem." Such scenarios are simply not supported by the vast bulk of pertinent experimental data. Two other phenomena that suggest the predicted decline in oceanic pH will have little to no lasting negative effects on marine life are the abilities of essentially all forms of life to adapt and evolve. Of those experiments in the database that report the length of time the organisms were subjected to reduced pH levels, for example, the median value was only four days. And many of the experiments were conducted over periods of only a few hours, which is much too short a time for organisms to adapt or evolve to successfully cope with new environmental conditions. And when one allows for such phenomena -- as oceanic pH declines ever-so-slowly in the real world of nature -- the possibility of marine life experiencing a negative response to ocean acidification becomes even less likely (Idso, 2009).